This would be a dream house for any child and being able to watch the kids as the play inside, run in and out and just enjoy all that the 10′ x 8′ Traditional Swiss Cottage Playhouse has to offer, will see you get as much enjoyment out of this as they will. This is a structure that will stand with pride in any garden and will always bring a smile on your face no matter if the kids are playing in it or if you just glance at it out of your window. The upper level of the playhouse adds even more space for them to make use of and pretend that they have their own little house. 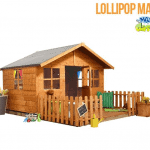 The dormer window, decking and that lovely little veranda are some of the stand out features of this adorable playhouse. You really are getting a fantastic playhouse here. It is made with high quality redwood tongue and groove cladding that makes it strong and gives it a great look. 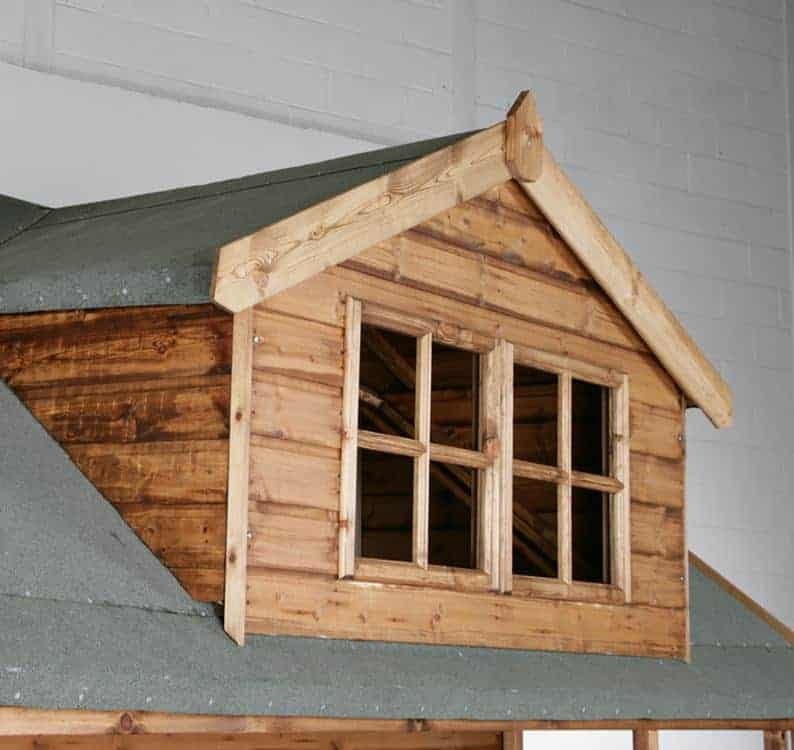 There is an apex style roof to protect against rainfall and the whole playhouse has passed every child safety test that it has been put through. This really is one of the most high quality and gorgeous looking child playhouses that you can buy. 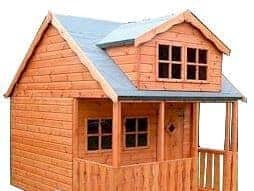 The only thing that looks better than this amazing 10′ x 8′ Traditional Swiss Cottage Playhouse is seeing the smile on the kids’ faces as they run towards it ready to explore and organise their dream playhouse. Inside the playhouse the kids will have just a ton of space to play with. 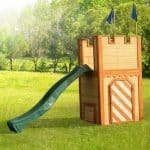 This is a two storey playhouse and overall there is 10 feet of depth and 8 feet of depth. This is quite a high structure in that at the very top of the playhouse it stands at an incredible 9 feet 2 inches. This is just a fantastic looking structure that looks more like a mini house than it does a place for children to play. Made with very strong redwood this is going to be something that the kids can enjoy for many years. There is a very nice little veranda outside the playhouse where they can put a couple of chairs and enjoy sitting out in the sun, but be protected by the veranda. There is also this just lovely little picket fence around the front of which we really like. Inside there is a ladder so that the kids can reach the upper level safely. 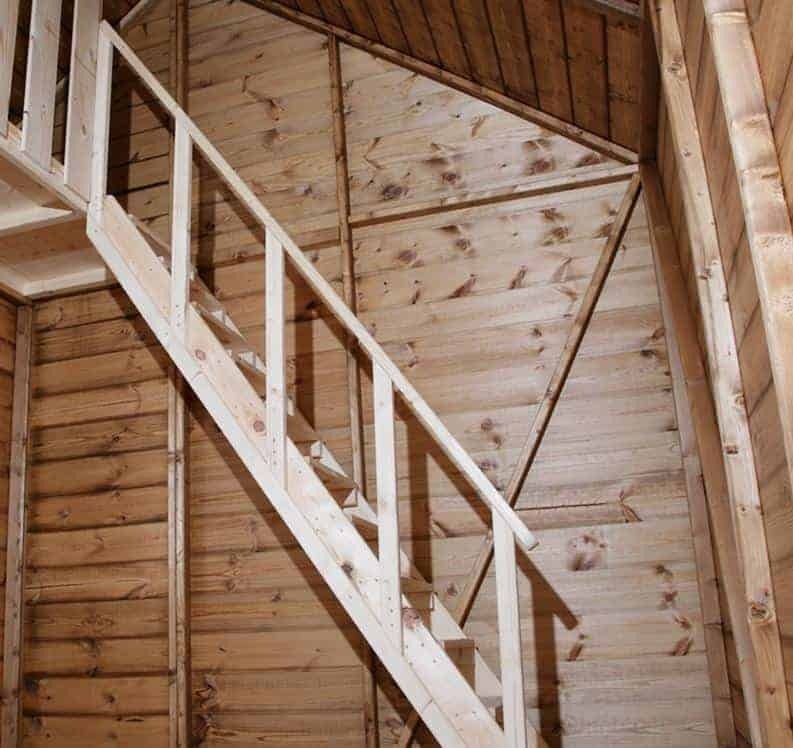 This is a safe ladder, actually it is more like a mini stair case and it has a railing and has been approved as being kid safe. The apex roof along with the top quality roofing felt that is covering it is going to keep everything inside safe from bad weather. The boards used here are 12 mm thick which is actually a couple of mm more than we usually see on a roof. There is a fantastic little dormer window that also has its own apex roof and is made from the same style of boards. This dormer window is just so charming and we are sure you are going to want to take lots of photos of the kids looking out this window. The cladding is made from high quality redwood and is done in a very nice looking tongue and groove style. 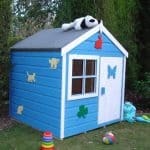 We absolutely adore the way the cladding looks on this playhouse it makes it look just so high quality. The cladding is a very respectable 12 mm thick and this will ensure that the walls are strong enough to take whatever mayhem the kids are causing inside. We think that the designers did just an amazing job with this playhouse, it has the look of an old timey log cabin you would find hidden in the woods. The 44 x 27 mm. frame which is the backbone of this playhouse is very impressive. Like everything else it is made from that amazing redwood. One thing that we were very impressed with was how the frame at the edges is rounded. This first of all looks fantastic, but it also greatly reduces the edges that kids can bump into inside. Kids can be crazy and between their regular shenanigans and those One Direction dance moves they will be doing inside here, it is fair to say that the floor is going to take a bit of a pounding. The floor though is made with the same 12 mm boards which are used for the roof. Along with the floor joists the children will have a very strong and sturdy floor under their feet. The 10′ x 8′ Traditional Swiss Cottage Playhouse will be dip treated with some fairly high quality treatment that will last for the first month. You will then want to give it a good coating of wood treatment and then do it again on a yearly basis to ensure that the gorgeous redwood is well protected. 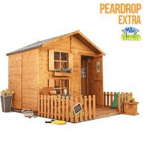 You will get a one year guarantee with this playhouse and we feel that with how high quality the materials are the playhouse will still be standing long after the kids are too big to get inside it. The door on here is lovely and helps add to the overall look of the playhouse. It is held in place with some antique style hinges which look very classy and can handle the odd slam which kids love to do. There is a little window on the door so that the kids can have some fun and see who is knocking before they open the door. Windows are a pretty big feature here and including the little one that is on the door there are five windows. The windows are made from high quality styrene to ensure there will be no broken glass or any issues with them. There are two on the front of the playhouse and we have the two on the dormer window as well. These let in a lot of natural light and let you be able to peek inside and see them enjoying the playhouse. 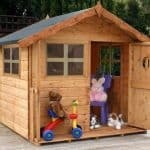 Not only is this playhouse made to be very secure it has also been made to meet all child safety standards. We are very pleased with how secure this is and are certain that your kids are going to be safe as they have the time of their lives inside. There is not a lot of privacy available here, but as this is for kids we think this is actually a good thing. Those windows allow you to see into the whole playhouse so you are always going to be able to check in and make sure that things are not getting too crazy in there. We love the look of the redwood, but if you did want to change things up a little bit then some coloured wood treatment would do the trick. We also think it would be fun for kids to pick some hanging baskets and perhaps a table and chair to go on their decking. You do not need to worry about having to spend a whole lot of money on any extras with this playhouse as you get everything you need for the kids to have a great time with it. The door does not have a lock, but we do not think you would want to have to deal with locking and unlocking the door all the time anyway. This is not a cheap playhouse, but you are getting the very best materials here that have been cleverly designed so that they can take the rough and tumble which kids love to do. With just a coating of treatment each year, we are sure that this playhouse will last for a number of years and provide a lot of fun for the kids. Thanks to the upper level and the little decking outside the kids will have a lot of room to play with. This is a large playhouse and it will not be the easiest job in the world to put together. You will need a friend to help you and as long as you read the instructions properly then it should take you around 8 hours to build. We know that the over one thousand pounds price tag may seem off putting at first, but you really cannot put a price on the years of enjoyment this playhouse is going to provide. Plus it really is made with the best materials so you are getting a lot of quality for your money. 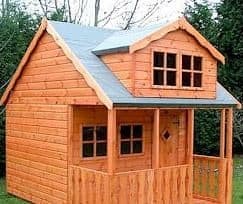 Final Thoughts: The 10' x 8' Traditional Swiss Cottage Playhouse looks fantastic and from the first moment you see it, you know that the kids are going to absolutely love it. It has been designed with kids in mind and as a result it is made with the strongest and most durable materials that have also been approved for children to ensure a safe environment for them to play. The price is high, but this playhouse if you look after it could not only last you for your kids, but their kids as well. 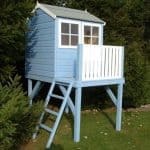 If a high quality playhouse that is going to last for a lot of years is what you are looking for then this is one of the very best we have seen.